The records of the University of Pennsylvania Library were transferred to the Archives in 1972 (2 linear ft. transferred by Bernard Ford, May 31, 1972), 1977 (0.25 linear ft. transferred by Bernard Ford, June 7, 1977), 1986 (29 linear ft. transferred by Bernard Ford, July 15, 1986) and in 1992 (7 linear ft. transferred from Special Collections, June 12, 1992). The University Library dates to 1749 with a gift of books from Richard Jackson, a London lawyer and politician. Within a few years, Benjamin Franklin and William Smith donated additional volumes. In 1784 Louis XVI of France presented the Library with 100 volumes. When the University moved from its Fourth and Arch Streets location to its present West Philadelphia address in 1872, the library was housed on the first floor of College Hall. By 1890, the Library’s 55,000 bound volumes were ready for their own building and moved into specially prepared quarters, a building by the famed Philadelphia architect, Frank Furness. 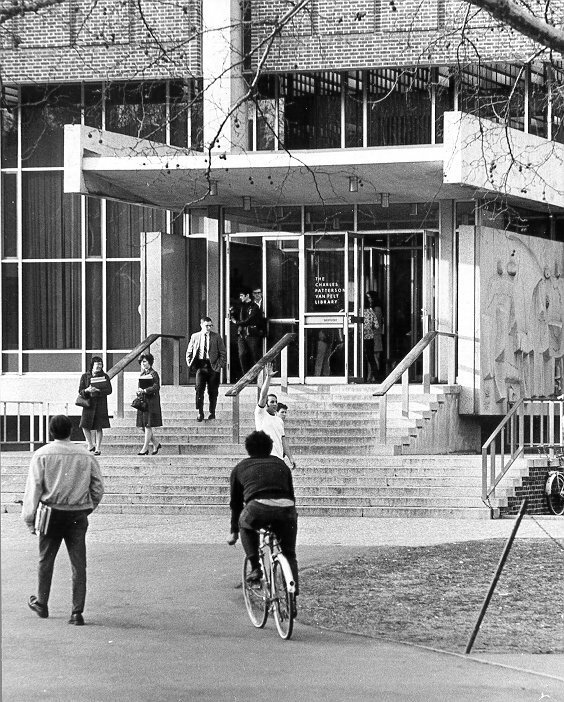 Continuing to grow at a steady pace, the Library again recognized a need for expansion and prepared to move, in 1962, across the green to new facilities designed by Harbeson, Hough, Livingston, and Larson. Constructed from 1958 to 1962, the Van Pelt Library is the general library serving the University community. The second half of the building, named for Daniel W. and H. Richard Dietrich, was completed in 1966. In addition, the library system consists of the following branch libraries: Annenberg School Library, Biddle Law Library, Biomedical Library, Chemistry Library, Dental School Library, Engineering and Applied Science Library, Fisher Fine Arts Library, Lippincott Library of the Wharton School, Math Physics Astronomy Library, Music Library, Museum Library, and Veterinary Library. Presently the University Library holds over three million volumes. The records, 1890-1979, for the University of Pennsylvania Library deal primarily with the operation of the Library from the Furness building but also includes information on the fundraising for and construction of the Van Pelt-Dietrich Library. The records include: correspondence with booksellers, 1892-1904; correspondence of the Library Trustee Committee, 1909-1946; budget material, 1909-1927, 1950-1979; annual reports, 1931-1957; ledgers on petty cash, 1903-1960, appropriations, 1897-1939, book funds, 1890-1939; minutes, 1953-1965; annual statistical reports, 1903-1962; library expansion plans of George Wharton Pepper (chair of the committee), 1948-1954; construction and furniture files, 1958-1962; circulation and reference reports, 1946­1957; specifications for the Graduate Library Center for Graduate Studies, 1958-1962. Directory of people associated with the Library (faculty, students, trustees, etc.) with residences, addresses, and library account numbers. 1898-1904. Four volumes. Phones, Woodwork also State G.S.A.